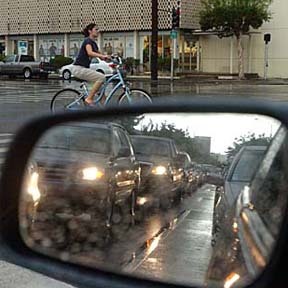 A bicyclist crossed wet streets at the intersection of King and McCully streets yesterday. At 5 p.m. it was gloomy enough for some motorists to turn on their headlights. The unstable weather, with showers and storms popping up at random throughout the islands, is forecast to continue today and clear sometime tonight.